Allyn arrived at their supposedly empty home after an 11-hour drive, slung her bags over her shoulder and climbed the stairs. And there was Todd, clasping flowers, Pink Floyd playing in the background, phone set to record his proposal, which you can watch on Vimeo.com/169635163. The venues for the wedding and reception combined Todd’s interest in history and engineering with Allyn’s feminine, classical taste. Their main colors were black and white, with accents of light pink and gold. The bride wore a strapless, floor length David Tutera organza gown with a sweetheart neckline, A-line silhouette and a slightly curved back bodice with cascading covered buttons. The bodice fabric was lace with beads and the skirt was a lace overlay with a scalloped hem and chapel length train. She wore a single-tier cathedral length raw edge veil. Her accessories included a diamond pendant necklace that had belonged to her late paternal grandmother, pearl and cubic zirconia drop earrings and a delicate pearl bracelet custom-made by her mother. She wore her hair swept up on one side, with curls. On her feet she wore rhinestone-embellished Badgley Mischka high heels. She carried a hand-tied bouquet of white peonies, white O’Hara garden roses and ranunculus. 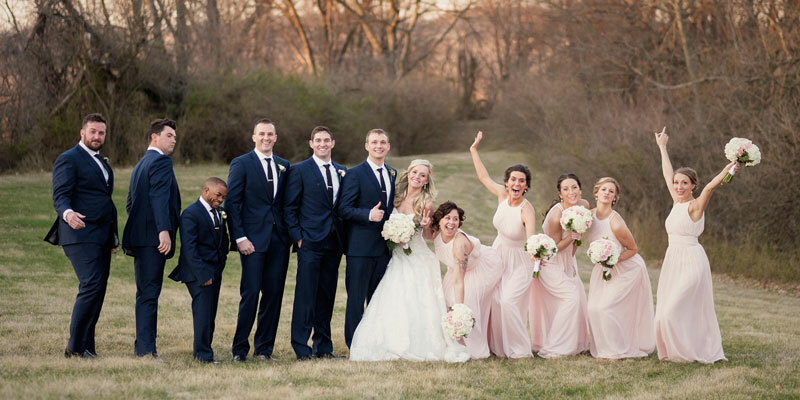 Bridesmaids wore petal pink Bill Levkoff sleeveless gowns with high chiffon neck and diagonal pleats on the bodice, a keyhole back and softly gathered skirt flowing from a ruched cummerbund. They carried hand-tied bouquets of white hydrangea, Polo roses, variegated pittosporum and pink Majorca spray roses with a white wrap. The groom wore a custom Joe by Joseph Abboud dark blue suit with a black paisley tie, black shoes and belt and a personalized tie clip. His boutonnière was white ranunculus. Groomsmen’s attire matched his. Jeff Weable, a cousin of the bride, officiated at the ceremony. The bride and groom wrote the ceremony script and their vows, which incorporated what was most important to each of them in a marriage. 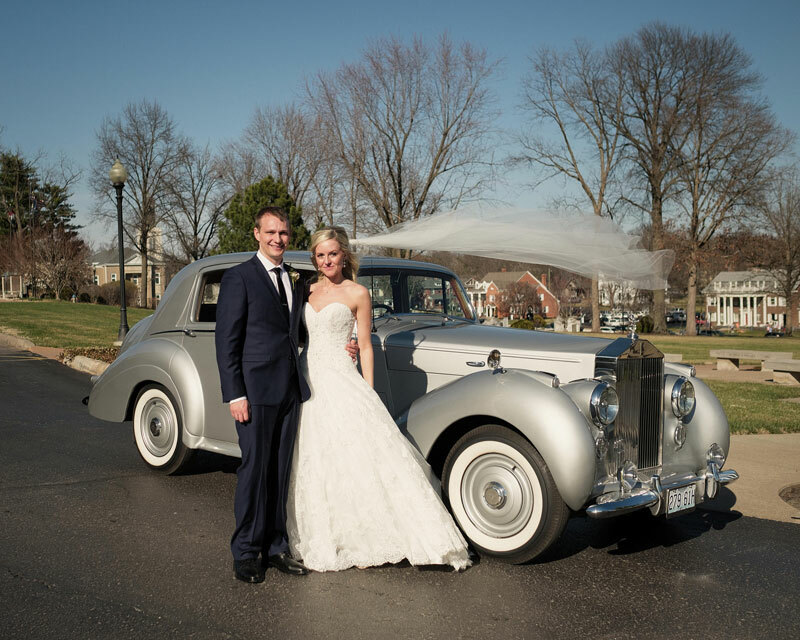 At the end of the ceremony, the couple exited the church and stepped into a Rolls Royce, restored by a friend of the bride’s mother, for the drive to the reception in Jefferson City. Tables were topped with white linens, gold chargers and white table settings with gold trim. All the flower arrangements were white and green with touches of pink. Hydrangeas and giant white garden roses were combined to form tall arrangements and wreaths surrounding floating candles. Italian string lights formed a faux ceiling and backdrop behind the head table, which was placed on the stage and accented by a six-foot flower-covered ladder suspended overhead. A four-tier cake iced “imperfectly” with ridges showing was decorated with white and pink roses on a gold cake stand. The top tier was chocolate coconut, a mash-up of the bride and groom’s favorite flavors. It was framed by a “greenery wall” created by the bride with the words “We do” in the center. 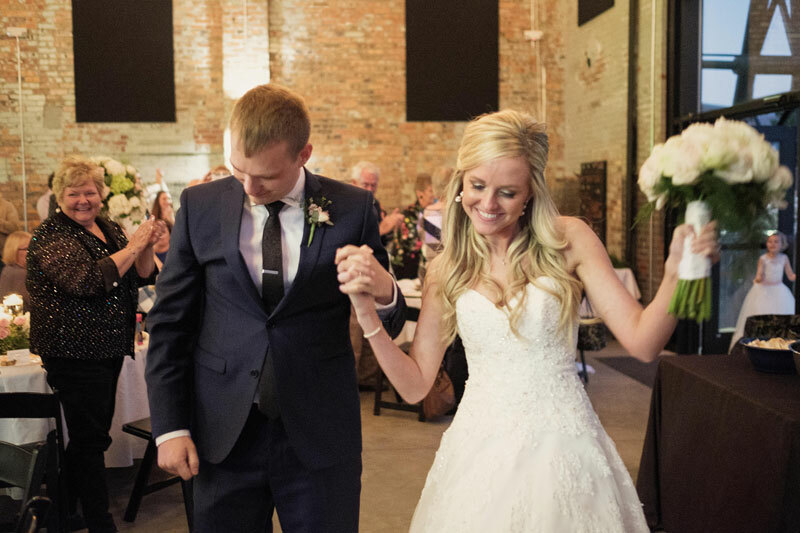 The couple had a delayed honeymoon in Las Vegas and returned to their home in Jefferson City. Allyn teaches fourth grade at McIntire Elementary School in Fulton. Todd is operations supervisor at the Callaway Nuclear Plant. The bride is the daughter of Pam Fitzgerald of Osage Beach and Scott and Vanette Gibbs of Columbia. The groom is the son of Warren and Joni Witt of Jefferson City.